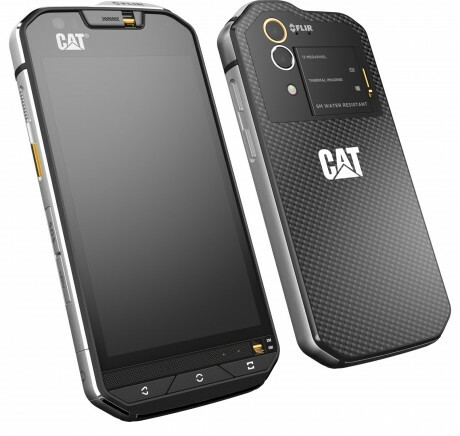 Cat Phones today announced the S60 smartphone, a fully rugged handset that is the first to include a thermal camera. The thermal camera allows the S60 to see and take pictures of heat signatures at a range of 50 to 100 feet. Cat says the camera can be used to view heat loss around windows/doors, see over-heating electrical appliance, and see in the dark. The S60 is also more waterproof than most other rugged handsets. It can sit in five meters of water for up to an hour. The S60 has a 4.7-inch HD screen with Gorilla Glass 4, wet finger tracking, and glove support. The phone has a large 3800mAh battery and is powered by an octa-core Snapdragon 617 processor with 3 GB of RAM and 32 GB of storage. The Cat S60 has a 13-megapixel main camera and 5-megapixel front camera, and an extra loud speaker. The phone runs Android 6.0 Marshmallow. Cat expects to ship the S60 later this year for $599. CAT recently announced the S60, a rugged phone with one very unique feature: a true thermal imaging "camera" built right in. CAT has a short but respectable history releasing very rugged phones that might appeal to construction and other field workers. Cat Phones today unveiled the S61, an update to the S60. The S61 is a fully rugged Android smartphone that is waterproof, dirtproof, and able to handle temperature extremes, drops, vibration, and salt water. This one seems pretty frickin awesome.